Greek Coffee Dandali 550gr was added to your shopping cart. Famous traditional Greek Cretan coffee Dandalis available in a set of 5, 110gr airtight aluminum bags, so that you always enjoy fresh aromatic Greek coffee. 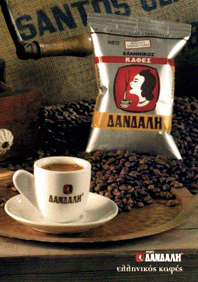 The most famous Greek coffee brand in Crete is Dandalis coffee made from a wonderful blend of fine coffee varieties. With over 60 years tradition, Dandalis knows coffee and has fanatic customers not only in Crete but all over Greece and the world. Cretans stop by Dandalis traditional coffee mill in Heraklion’s central market to purchase freshly milled aromatic Greek coffee. For those living away from Heraklion, Dandalis company offers freshly packed coffee in airtight aluminum packaging to preserve its aroma and freshness. You can buy fresh Dandali coffee in our eshop. We recommend the 5 bag set of 100gr each with 10% more product free. The 100gr size is the most practical so that you always have fresh aromatic coffee. There are also packages of 200gr, 500gr and 1kg available for professional establishments (cafeterias, restaurants, etc). Please contact us at info@mycretangoods.com.